One Lost Teddy Bear. One Big Adventure. Robert Goodin is an animator who’s worked on TV shows like Rugrats and American Dad. Now he’s taken some time out from that the craft his first hardcover graphic novel, The Kurdles. “In the spirit of Hergé’s Tintin or Carl Barks’ Uncle Scrooge, The Kurdles is an all-ages comic spiced up with a teaspoon of strange. Sally is a teddy bear who gets separated from her owner while on a drive in the country. Desperate to find her way home, she stumbles upon Kurdleton, home to a most peculiar group of characters in the midst of a crisis; their forest house has grown hair, eyes, and a mouth! 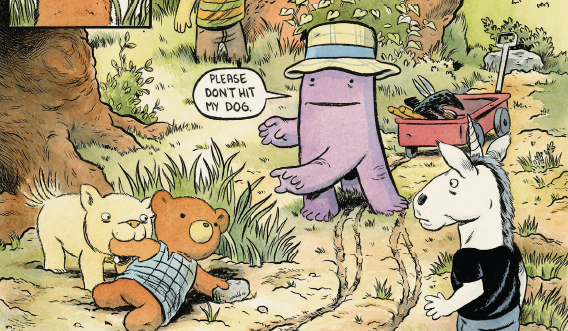 The creatures work with their new friend to keep Kurdleton from growing legs and running away!” Check it out over at the publisher, Fantagraphics Books.